Where Can I Buy Milk Kefir Grains, Canada? Where Can I Buy Milk Kefir Grains if I Live in Canada? 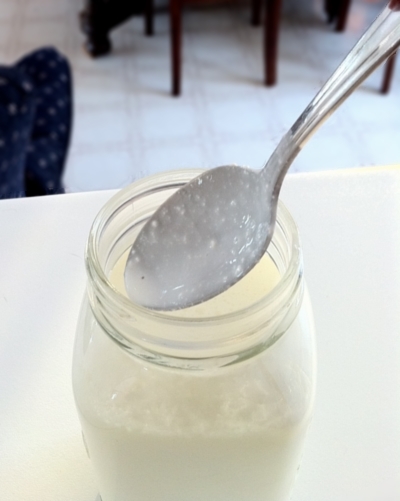 Milk kefir starters are a little more prevalent, but the kefir starters can only be used for a short time before they lose their potency, whereas kefir milk grains can be saved and used for many lifetimes, being passed down for generations. Kefir grains are meant to be shared. Like many cultural dietary inclusions and medicines, kefir is a functional beverage that is only just becoming more widely known in North America. North America is a new 'culture' that seems to have (in many instances) lost touch with ancestral roots. Many things; folk lore, knowledge of natural cures, recipes, and healthy foods to name a few, are no longer shared. Before the internet, the knowledge of such things was lost in the new world. I find that the farther west you go in North America, the more likely you are to find alternative medicine and food practices. I think there are many reasons for this, but mainly Western Canada and U.S. is both more densely populated and much more culturally diverse. Also the western shore is closer to Asia where alternative health is part of their culture! Thanks to the internet, a local economy is becoming more global. Knowledge of different cultures is available in most homes now, and people who wish to learn about the healthy traditions of long lost ancestors can easily find that information. Once I had the knowledge of the health benefits of milk kefir, and the experience of making milk kefir from grains, I felt it my duty to make available the milk kefir grains. Canada is not so entrenched in their own culture that there is no room for something so delicious and beneficial to health. Milk Kefir IS a part of our everybody's ancestral heritage if we go back far enough. I have canned organic coconut cream you said it could possibly be added to the second fermentation when it goes in the fridge. You think it would be ok if I added some. Or like you when I blend it in the morning I add blueberries, mango, chia seeds, hemp seed and I could just through the coconut cream in then. Just thought the coconut cream might give it a nicer taste in the second ferment overnight in the fridge. Hi Stella I am a firm believer in experimentation! Give it a try and see how you like it! Your smoothie recipe sounds delish! 1- first try more milk and less grains for a couple of weeks. 3- if you are shaking or stirring every few hours- try not doing that and see what happens. Just know that kefir is affected by environmental changes so even something like more humidity or a change of season will affect the behaviour and consistency of the kefir. If you don’t mind the taste of your kefir, it really shouldn’t matter much whether it separates or not, right?